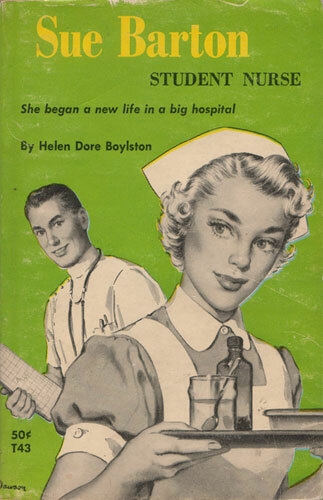 She began a new life in a big hospital. Sue looked for a place to escape from the terrible Mrs. Pasquale. There it was — a small door — probably a broom closet. Sue jerked open the door. She stepped in and — dropped! Down and down she fell. Then she struck bottom — soft, yielding bottom. She had fallen down the laundry chute. Adventures — comic, exciting, dangerous — mark Sue Barton’s first year as Student Nurse.